I happened upon this group of small trees on a gray day in spring near the shore of Lake Harriet in Minneapolis. They’re not dramatic as you pass by, but they have great color, shapes, and angles. This is a reduction woodblock print, about 8.5″ square. 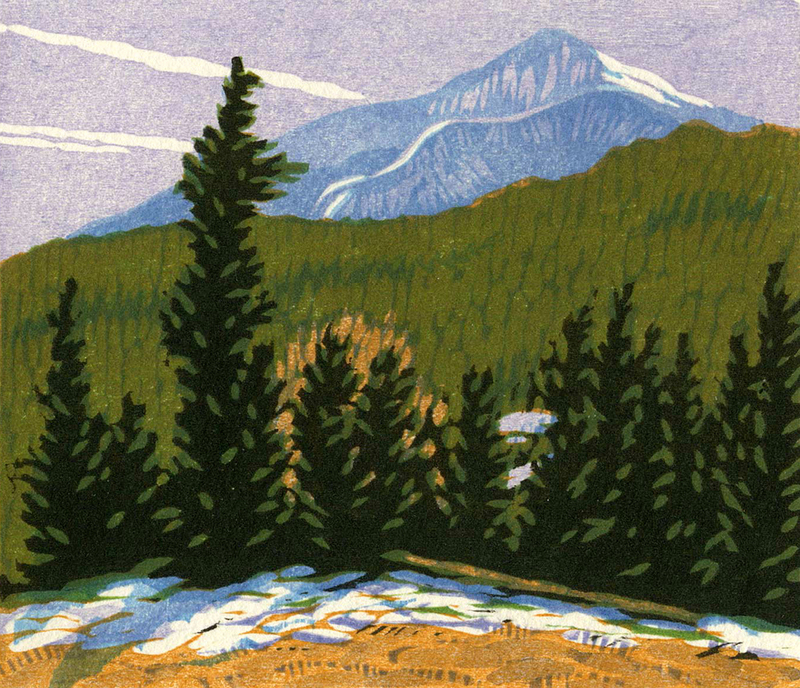 The golden hills in the golden state of California are the inspiration for this woodblock print. The hills often don’t seem to be very big, but they make the giant oaks look tiny. Minneapolis band, ‘All the Islands’. A scene from a Boundary Waters canoe trip. The water was still and glassy enough, without a sound anywhere, that it was almost surreal to see the island and clouds perfectly reversed in the water. My print doesn’t do it justice. This is a small woodblock print I just finished of the Gallatin River in Montana, between Bozeman and Big Sky. It’s a reduction print, pulled from one block of cherry wood, about 5 inches square. I’ve done several versions of this scene and will show a few more in upcoming posts. Winter Creek is a single block print with watercolor. Printed on Somerset paper. Light of the Rock is a single block print with watercolor. Printed on Somerset paper. Inspired by a hike in early autumn in Montana. Blue Mountain is a multi-block woodblock print pulled from six blocks of basswood; 4.0″ x 4.5″; printed on Somerset paper with oil-based inks; $175. Jim Meyer Blog at WordPress.com.